Fire crews are fighting a large fire in the centre of a south Wales town, say emergency services. Around 40 firefighters are tackling the blaze at the Happy Furnishings store in Commercial Street, Maesteg, said South Wales Fire and Rescue Service. 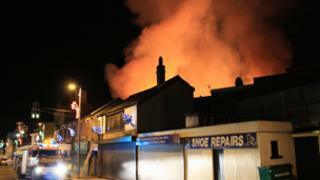 Six fire engines have attended the fire, which was reported at 1830 GMT. South Wales Police said the area is cordoned off but no evacuations have been necessary.